During the past 20 years, cardiac MRI (CMR) has earned growing acceptance as a modality for assessing myocardial ischemia, viability, and function. Accurately assessing ischemic risk and identifying hemodynamically significant coronary artery disease amenable to revascularization can be challenging tasks with non-invasive imaging modalities. Here, we aim to discuss how cardiac MRI achieves both with a single study without exposure to ionizing radiation. 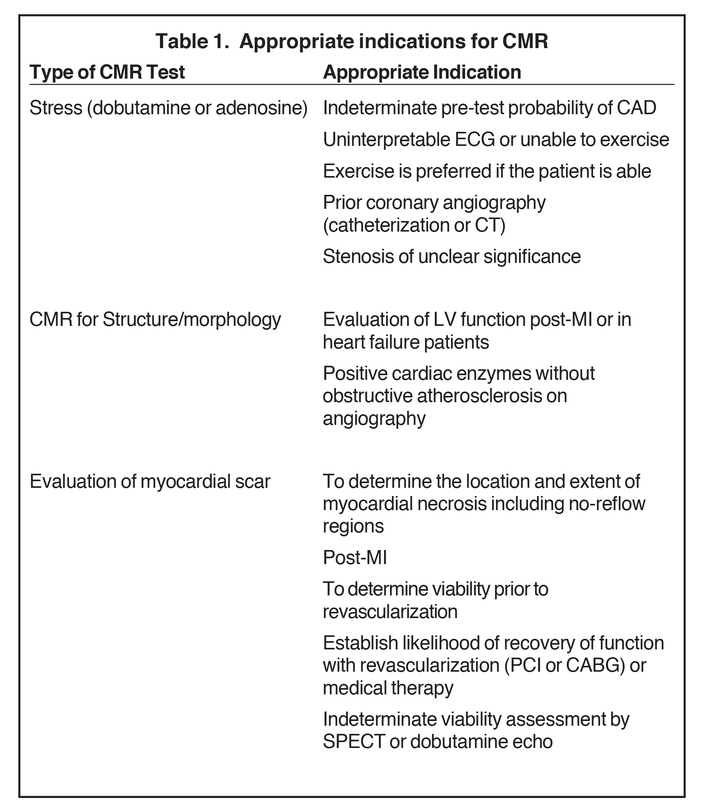 Table 1 lists the appropriate indications for the use of CMR as reported in the 2006 ACCF/ACR/SCCT/SCMR/ASNC/NASCI/SCAI/SIR appropriateness criteria for cardiac computed tomography and cardiac magnetic resonance imaging. Epicardial arteries and resistance arterioles comprise the coronary blood supply. In the absence of epicardial coronary stenosis, an increased oxygen myocardial demand can be achieved by an increase in coronary flow due to arterial vasodilatation, commonly referred to as “coronary reserve,” which can increase up to four times the basal blood flow. This is shown in Figure 1. In the presence of an epicardial stenosis, as the coronaries are already dilated to maintain constant coronary flow, it is unable to augment further in the event of increased myocardial demand.2The resulting oxygen demand and supply mismatch leads to myocardial ischemia at rest if blood flow is insufficient at basal conditions and ischemia on stress if an increased oxygen demand exceeds oxygen supply. Myocardial ischemia can be identified by metabolic alterations detected with PET imaging, perfusion defect reversibility detected by CMR with adenosine/Lexisan, dipyridamole or dobutamine, regional wall motion abnormalities seen by echocardiography and CMR, or ECG changes detected by standard stress test treadmill. The most commonly used pharmacological agents for stress testing include: adenosine infusion (or regadenoson, which is administered as a bolus), dipyridamole, and dobutamine. Coronary vasodilators—Adenosine, regadenosine, and dipyrimadole are coronary vasodilators used for assessment of myocardial perfusion with CMR. They act via different mechanisms in the adenosine pathway, with adenosine directly binding to multiple types of adenosine receptors, regadenoson selectively binding to A2 receptors, and dipyrimidole blocking the cellular re-uptake of adenosine, to result in coronary vasodilatation and subsequent increase in coronary flow. In the presence of a significant coronary stenosis, these agents induce a relative hypoperfusion in the territory of the stenosis by a steal phenomenon, typically without inducing true ischemia. Contraindications to adenosine include second- or third-degree AV block, severe bronchospasm, or use of dipyridamole (which blocks the cellular uptake of adenosine, increasing the concentration of adenosine at its receptors). Dobutamine—Dobutamine is a sympathomimetic drug with a short half-life (2 min) that mainly acts on β1 cardiac receptors resulting in positive inotropic and chronotropic effects. It has a lesser mechanism of action on the β2 receptors with slight vasodilatory effect.4 Beta blockers are held 24 to 48 hours before the test as they counteract the effects of dobutamine. Continuous medical surveillance (blood pressure, ECG and SaO2 monitoring) is required during the performance of the examination. Coronary vasodilators—adenosine, diyprimadole—The following is a commonly used protocol for stress-perfusion CMR, previously described by Klem et al. Standard balanced steady state free precession (bSSFP) breath-hold cine sequences at rest in the standard views (apical, mid, and basal short-axis views; 4, 2, and 3 chamber views) are first acquired. Stress is induced with an adenosine infusion (140 μg/kg/min; total duration: 6 mins) or after dipyridamole slow injection (0.56-0.84 mg/kg). Immediately after the intravenous injection of a contrast agent (Gadolinium: 0.1 mmol/kg), MR first-pass perfusion scanning on stress is performed using identical views and a T1 weighted sequence such as magnetization-prepared fast gradient-recalled echo (GRE) with non-selective saturation recovery preparation pulse or a balanced steady state free precession (bSSFP) sequence. Generally 3 views (apical, mid and basal short axis) can be acquired every heartbeat, with 6 views every 2 heart beats, allowing a dynamic study of the perfusion. Standard CMR cine sequences are then performed to evaluate for wall motion abnormality. LGE sequences are then performed 10-15 mins following the initial gadolinium administration. Stress-perfusion images may be obtained prior to rest, given their relative importance to the study and fact that rest imaging is typically unnecessary following a normal stress evaluation. If stress CMR is performed initially, adenosine is advantageous given its short half-life, as no reversal agent is necessary. With both regadenoson and dipyrimadole, reversal with aminophylline may be performed. Dobutamine—The standard protocol begins with the acquisition of standard CINE SSFP sequences (apical, mid and basal short axis and 2, 3, 4 chamber long axis view) at rest. Dobutamine is then infused intravenously and the dosage is increased every 3 mins (10, 20, 30, 40, and 50 mg/kg per minute). A low level stress (5-10 μg/kg/minute of dobutamine) is used to assess viability whereas higher dose (up to 50 μg/kg/min) allows one to reach the theoretical maximal frequency to detect ischemia at stress. The infusion is stopped when 85% of the maximal heart rate is achieved, new or worsening wall motion abnormality develops in 1 or greater LV segments, BP increases to greater than 240/20mmHg or SBP drops >40mmHg, or if the patient develops adverse symptoms or persistent arrhythmias. At every 3 min stage, cine sequences with conventional views are repeated. Atropine (up to 2 mg) can be utilized to augment the heart rate response, although this is contraindicated in patients with narrow angle glaucoma, myasthenia gravis, obstructive uropathy, and obstructive gastrointestinal disorders. Contraindications to dobutamine include severe hypertension (>/=220/120mmHg), unstable angina, severe aortic stenosis (gradient >50mmHg or AVA <1cm2), uncontrolled atrial fibrillation, HCM, and CHF. Perfusion imaging may be performed with dobutamine; however, it is complicated by the resultant heart rate increase not seen with adenosine and dipyrimadole. 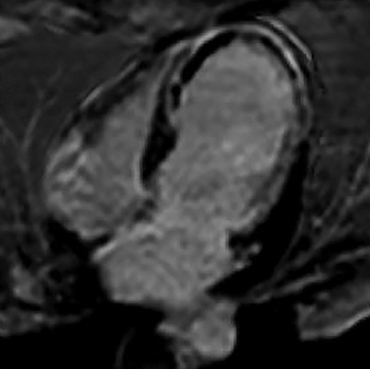 In clinical practice, myocardial perfusion is assessed with CMR by evaluation of contrast enhancement during the first pass of a contrast agent bolus through the cardiac chambers and the myocardium using gadolinium and the stress agent (adenosine/Regadenoson, dipyridamole, or dobutamine). 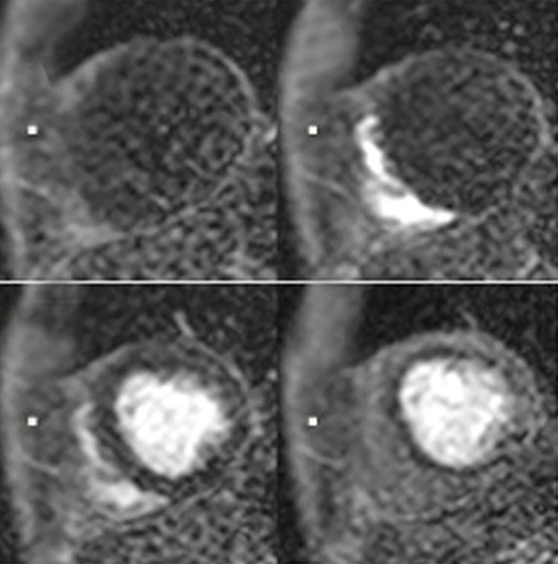 Perfusion CMR images are analyzed using the AHA 17 segment model (shown in Figure 3). The presence of segmental myocardial hypoenhancement reflects a relative hypoperfusion in comparison to other territories. 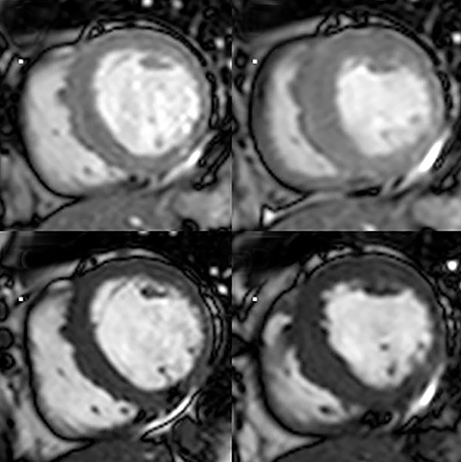 Examples of first pass CMR perfusion images are shown in Figure 4. Short axis cine sequences at rest and stress are shown in Figure 5. LGE is a well-documented technique that allows detection of myocardial scar with gadolinium, which shortens the T1 relaxation time. The addition of this sequence to CINE SSFP and perfusion CMR provides valuable information regarding myocardial viability as well as expected recovery following revascularization. After the administration of the extracellular contrast agent (gadolinium chelates are typically used), infarcted or fibrotic tissue demonstrates increased signal on T1-weighted sequences due to reduced clearance and increased volume of distribution of the contrast agent in these regions.9 Ten to 30 minutes after intravenous injection of gadolinium (0.10-0.20 mmol/kg), gradient-echo inversion recovery (FLASH/PSIR) sequences are performed. The inversion time is set with a Look-Locker sequence at the point of optimal myocardial nulling, allowing a better quantification of the infarcted bright zone. The infarct size defined by LGE hyperenhancement is a well-established strong predictor of outcomes after myocardial infarction (MI).10 Examples are shown in Figure 6. The transmural extent of hyperenhancement (<25%, 25-50%, 50-75%, >75%) predicts the functional improvement of the myocardium.11 In clinical practice, 50% transmurality of LGE is considered as a reasonable and practical cut-off to predict functional recovery after revascularization.12 LGE also detects microvascular obstruction (MVO) after acute MI, which is associated with poor clinical outcomes.13 MVO appears as an area of low signal intensity surrounded by enhancement and is described in Figure 7. 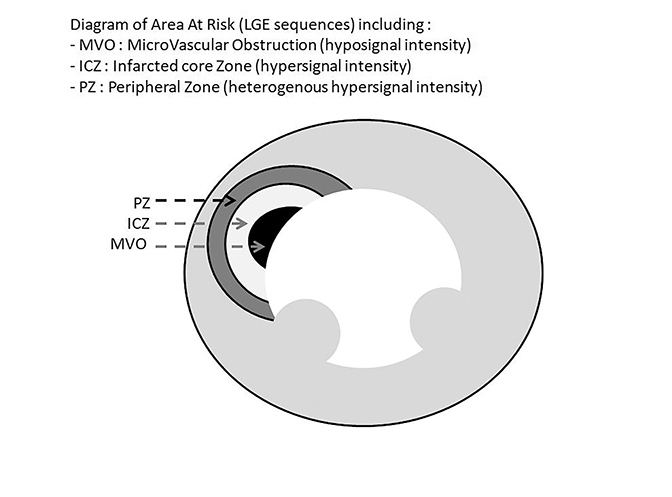 After an acute MI, LGE is useful to assess size, extension, transmurality of the infarcted zone, and the presence of MVO. 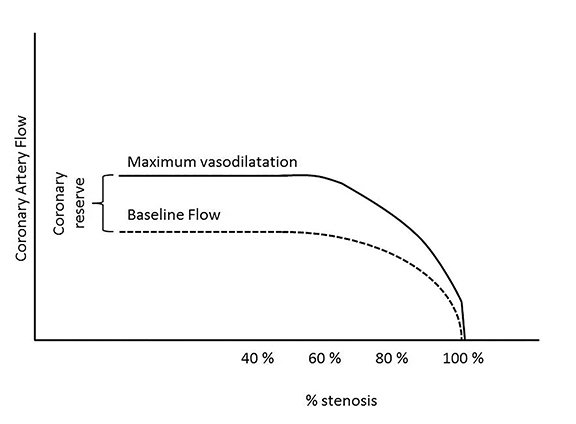 In case of a chronic MI, the sequence can assess viability for possible revascularization. This sequence is also useful for distinguishing between ischemic cardiomyopathy with the presence of segmental, subendocardial LGE or transmural LGE from a non-ischemic process, such as with myocarditis or Takotsubo cardiomyopathy in patients presenting with acute chest pain and elevated cardiac enzymes.14 Figure 8 describes the zones of delayed enhancement seen in an area at risk. The safety of dobutamine CMR is comparable to dobutamine echocardiography with about 1 severe adverse event over 1000 scans.23 Perfusion stress MRI also has a good safety profile and greater feasibility than dobutamine stress MR, at approximately 100%. Excluding patients with contraindications to cardiac MRI, the main limitations to stress CMR include difficulty obtaining an acceptable ECG signal and patient claustrophobia. Contraindications are shown in Table 2. CMR is a safe and proven modality for detecting ischemic heart disease. Within a single study, CMR is able to assess rest and stress regional contraction, and localize and evaluate regions of myocardial ischemia and viability, of importance given the prognostic impact for the patient. With performance that is comparable to PET/SPECT and at times favorable compared to stress echocardiography, it is now an essential tool for diagnosing ischemia and for determining the likelihood of success following myocardial revascularization. Fihn SD, Gardin JM, Abrams J, et al. 2012 ACCF/AHA/ACP/AATS/PCNA/SCAI/STS Guideline for the diagnosis and management of patients with stable ischemic heart disease: a report of the American College of Cardiology Foundation/American Heart Association Task Force on Practice Guidelines, and the American College of Physicians, American Association for Thoracic Surgery, Preventive Cardiovascular Nurses Association, Society for Cardiovascular Angiography and Interventions, and Society of Thoracic Surgeons. J Am Coll Cardiol. 2012; 60(24): e44-e164. Gould K L, Lipscomb K. Effects of coronary stenoses on coronary flow reserve and resistance. Am J Cardiol. 1974; 34(1): 48-55. Nesto RW, Kowalchuk GJ. 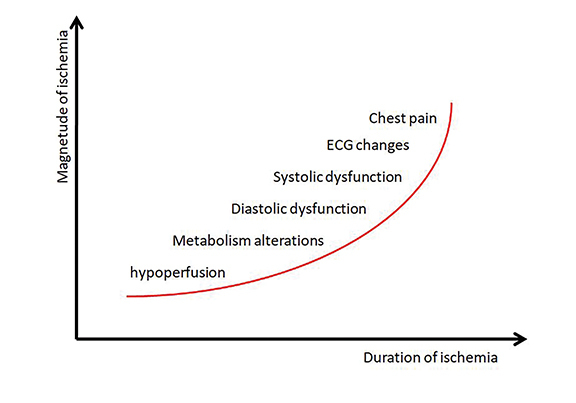 The ischemic cascade: temporal sequence of hemodynamic, electrocardiographic and symptomatic expressions of ischemia. Am J Cardiol. 1987; 59(7): 23C-30C. Sonnenblick EH, Frishman WH, LeJemtel TH. Dobutamine: a new synthetic cardioactive sympathetic amine. N Engl J Med. 1979; 300(1):17-22. Motwani M, Maredia N, Fairbairn TA, et al. High-resolution versus standard-resolution cardiovascular MR myocardial perfusion imaging for the detection of coronary artery disease. Circ Cardiovasc Imaging. 2012; 5(3): 306-313. Paetsch I, Jahnke C, Wahl A, et al. Comparison of dobutamine stress magnetic resonance, adenosine stress magnetic resonance, and adenosine stress magnetic resonance perfusion. Circulation. 2004; 110(7): 835-842. Cerqueira MD, Weissman NJ, Dilsizian V, et al. Standardized myocardial segmentation and nomenclature for tomographic imaging of the heart. A statement for healthcare professionals from the Cardiac Imaging Committee of the Council on Clinical Cardiology of the American Heart Association. Int J Cardiovasc Imaging. 2002; 18(1): 539-542. Bodi V, Sanchis J, Lopez-Lereu MP, et al. Prognostic value of dipyridamole stress cardiovascular magnetic resonance imaging in patients with known or suspected coronary artery disease. J Coll Cardiol Am. 2007; 50(12): 1174-1179. Saeed M, Wagner S, Wendland MF, et al. Occlusive and reperfused myocardial infarcts: differentiation with Mn-DPDP--enhanced MR imaging. Radiology, 1989. 172(1): p. 59-64. Wu E, Ortiz J, Tejedor P, et al. Infarct size by contrast enhanced cardiac magnetic resonance is a stronger predictor of outcomes than left ventricular ejection fraction or end-systolic volume index: prospective cohort study. Heart. 2007; 94:730-736. Beek AM, Kuhl HP, Bondarenko O, et al. Delayed contrast-enhanced magnetic resonance imaging for the prediction of regional functional improvement after acute myocardial infarction. J Am Coll Cardiol. 2003; 42(5): 895-901. Kim RJ, Wu E, Rafael A, et al. The use of contrast-enhanced magnetic resonance imaging to identify reversible myocardial dysfunction. N Engl J Med. 2000; 343(20): 1445-1453. Bogaert J, Kalantzi M, Rademakers FE, et al. Determinants and impact of microvascular obstruction in successfully reperfused ST-segment elevation myocardial infarction. Assessment by magnetic resonance imaging. Eur Radiol. 2007; 17(10): 2572-2580. Roffi M, Patrono C, Collet J P, et al. 2015 ESC Guidelines for the management of acute coronary syndromes in patients presenting without persistent ST-segment elevation: Task Force for the Management of Acute Coronary Syndromes in Patients Presenting without Persistent ST-Segment Elevation of the European Society of Cardiology (ESC). Eur Heart J. 2016; 37(3): 267-315. Nandalur KR, Dwamena BA, Choudhri AF, et al. Diagnostic performance of stress cardiac magnetic resonance imaging in the detection of coronary artery disease: a meta-analysis. J Am Coll Cardiol. 2007; 50(14): 1343-1353. Hamon M, Fau G, Nee G, et al. C. Meta-analysis of the diagnostic performance of stress perfusion cardiovascular magnetic resonanace for detection of coronary artery disease . J Cardiovasc Magn Reson. 2010; 12: 29. Schwitter J, Wacker CM, Wilke N, et al. MR-IMPACT II: Magnetic resonance imaging for myocardial perfusion assessment in coronary artery disease trial: perfusion-cardiac magnetic resonance vs. single-photon emission computed tomography for the detection of coronary artery disease: a comparative multicentre, multivendor trial. Eur Heart J. 2013;34(10): 775-781. Schwitter J, Nanz D, Kneifel S, et al. Assessment of myocardial perfusion in coronary artery disease by magnetic resonance: a comparison with positron emission tomography and coronary angiography. Circulation. 2001; 103(18): 2230-2235. Watkins S, McGeoch R, Lyne J, et al. Validation of magnetic resonance myocardial perfusion imaging with fractional flow reserve for the detection of significant coronary heart disease. Circulation. 2009; 120(22): 2207-2213. Vogel-Claussen J, Skrok J, Dombroski D, et al., Comprehensive adenosine stress perfusion MRI defines the etiology of chest pain in the emergency room: Comparison with nuclear stress test. J Magn Reson Imaging. 2009; 30(4): 753-762. Nagel E, Lehmkuhl HB, Bocksch W, et al. Noninvasive diagnosis of ischemia-induced wall motion abnormalities with the use of high-dose dobutamine stress MRI: comparison with dobutamine stress echocardiography. Circulation. 1999; 99(6): 763-770. Takx RA, Blomberg BA, El Aidi H, et al. Diagnostic accuracy of stress myocardial perfusion imaging compared to invasive coronary angiography with fractional flow reserve meta-analysis. Circ Cardiovasc Imaging, 2015. 8(1). Mertes H, Sawada SG, Ryan T, et al. Symptoms, adverse effects, and complications associated with dobutamine stress echocardiography. Experience in 1118 patients. Circulation. 1993; 88(1):15-19. Ordovas K.G, Higgins CB. Delayed contrast enhancement on MR images of myocardium: past, present, future. Radiology. 2011; 261(2): 358-3574. Higgins CB, Herfkens R, Lipton MJ, et al. Nuclear magnetic resonance imaging of acute myocardial infarction in dogs: alterations in magnetic relaxation times. Am J Cardiol. 1983; 52(1): 184-148. Giri S, Chung YC, Merchant A, et al. T2 quantification for improved detection of myocardial edema. J Cardiovasc Magn Reson. 2009; 11: 56. Taylor AJ, Salerno M, Dharmakumar R, et al. T1 mapping: basic techniques and clinical applications. JACC Cardiovasc Imaging. 2016; 9(1): 67-81. Dall’Armellina E, Ferreira VM, Kharbanda RK, et al. Diagnostic value of precontrast T1 mapping in acute and chronic myocardial infarction. JACC Cardiovasc Imaging. 2013; 6(6): 739-742. Kohsaka S, Makaryus AN. Coronary angiography using noninvasive imaging techniques of cardiac CT and MRI. Curr Cardiol Rev. 2008; 4(4): 323-330. Ishida M, Sakuma H. Coronary MR angiography revealed: how to optimize image quality. Magn Reson Imaging Clin N Am. 2015; 23(1): 117-125. Makowski MR, Henningsson M, Spuentrup, et al. Characterization of coronary atherosclerosis by magnetic resonance imaging. Circulation. 2013; 128(11): 1244-1255. De Carvalho FS, Mukai K, Clayton J, Ordovas K. Cardiac MRI: A preferred method for assessing myocardial ischemia and infarct burden. Appl Radiol. 2017;46(11):21-29. Dr. Seguro DeCarvalho is with the Federation Francaise de Cardiologie, Toulouse, France; Dr. Mukai is with the Division of Cardiology at the University of California-San Francisco, San Francisco, CA; Dr. Clayton and Dr. Ordovas are with the Department of Radiology and Biomedical Imaging at the University of California-San Francisco, San Francisco, CA.